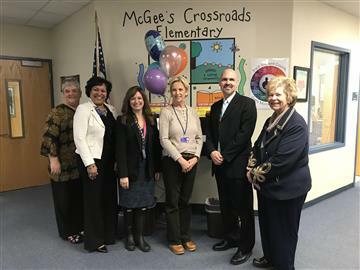 Mrs. Morse’s and Mrs. Thomas’ second grade classes hosted an Author’s Tea at McGee’s Crossroads Elementary School. 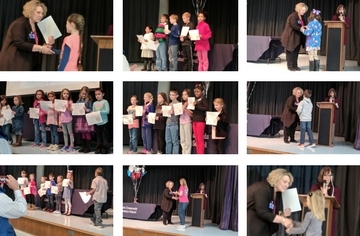 The event showcased the original poetry created by their students. 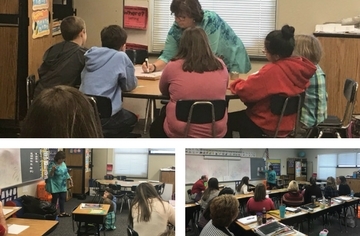 Parents, family members, and administration were invited to enjoy the student read-alouds of each child’s favorite piece of writing. 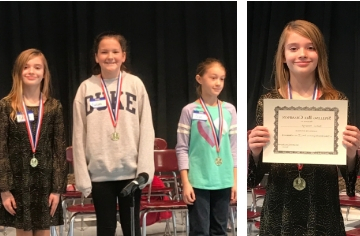 Each student was tasked with creating several different types of poetry, including: Acrostic, Cinquain, Couplet, and Haiku. 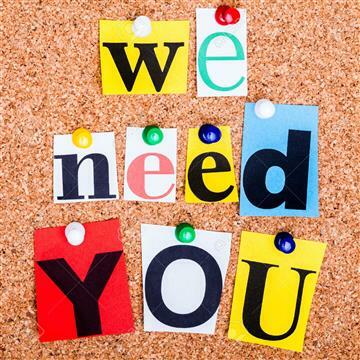 The learning purposes addressed included the following standards: ELA Literature Standard RL 2.4 - Describe how words and phrases supply rhythm and meaning in a story, poem, or song; Speaking and Listening Standard SL..2.4 - Tell a story or recount an experience with appropriate facts and relevant, descriptive details, speaking audibly in coherent and complete sentences; and, Language Standard L.2.6 - Use words and phrases learned through conversations, reading, and being read to, and responding to texts, including using adjectives and adverbs to describe. 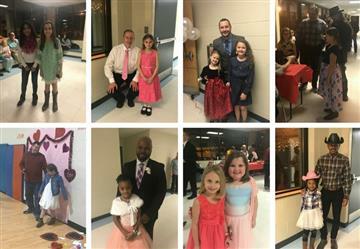 Students and families enjoyed refreshments as they circulated the room to listen to the young authors and to provide complimentary notes and positive feedback to be included with their poetry books. 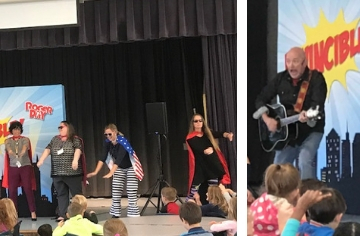 Doug Berky of the United Arts Council Performs for 2nd and 3rd Grade Students. 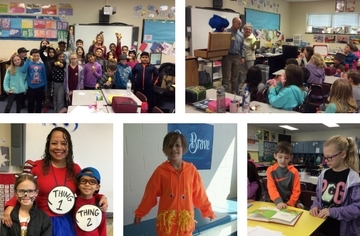 Doug Berky entertained our second and third graders with folk stories, amazing masks and puppets. 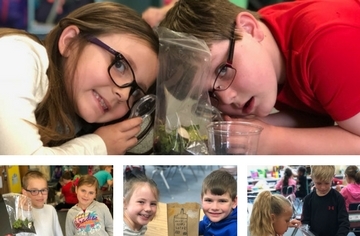 Students from Pre-K through 5th grades have had the opportunity to see eight quality performances this year through the UA programming which is sponsored by the Johnston Arts Council and MCES PTA. 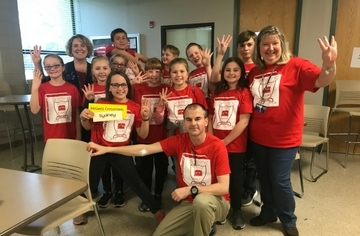 2019 Battle of the Books team takes 2nd place! 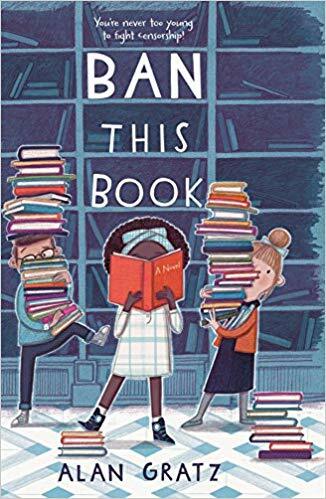 Congratulations to our Battle of the Books Team lead by Ben Anderson and Betty Buchanan!!! 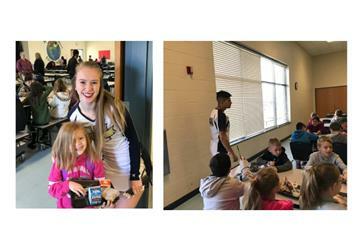 NC Weslyan University Cheerleaders came by to celebrate with students during breakfast. 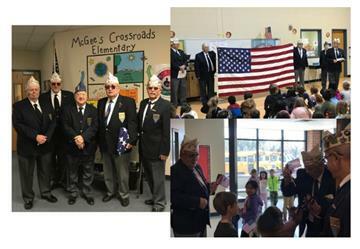 Johnston County American Veterans shared American flag history with our first graders! 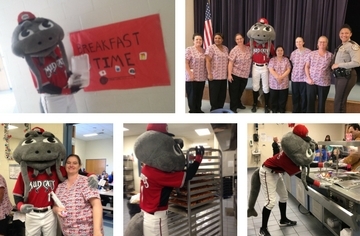 Campbell University’s Swim Team and Board of Education member Terry Sessoms help us Celebrate National Breakfast Week. 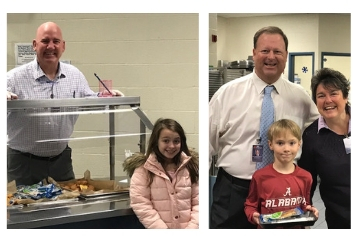 Dr. Renfrow, Board of Education Members Chair Mike Wooten and Teresa Grant serve McGee’s students breakfast during National Breakfast Week! 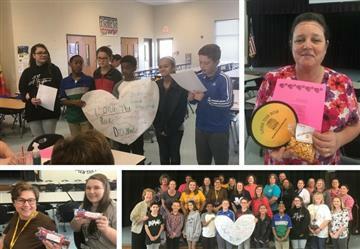 Student Council Honors Our Bus Drivers during Love The Bus Week! 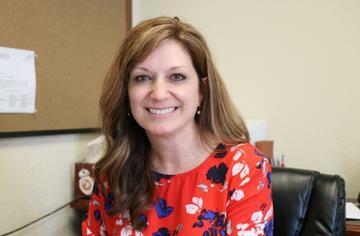 We are so proud of JoAnn Hood, our Head Secretary/Bookeeper, for being chosen as the Classified Employee of the month. 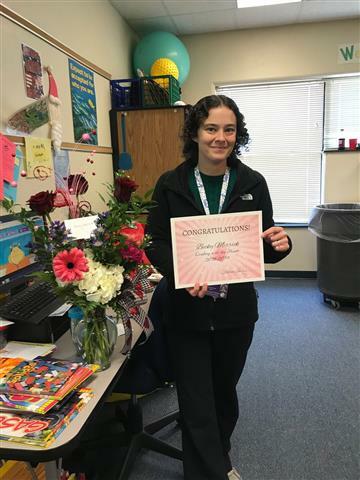 Congratulations to Becky Merrick who is our McGee’s Crossroads Elementary Leading with the Heart Nominee for the 2018-19 school year!! 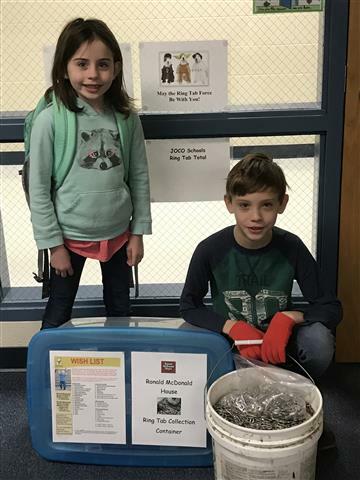 McGee’s Crossroads Elementary Collects Ring Tabs for the Ronald McDonald House to Help Families. 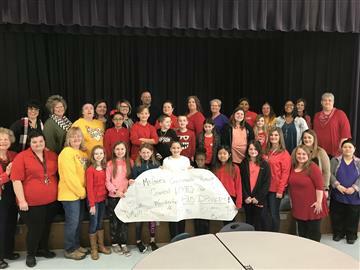 Paxtyn and Parker Jeans contributed along with many other students. 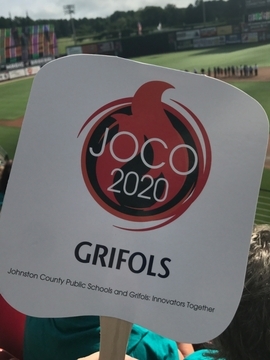 Keep sending in those ring tabs, we want to be the top school in Johnston County! Go Patriots! 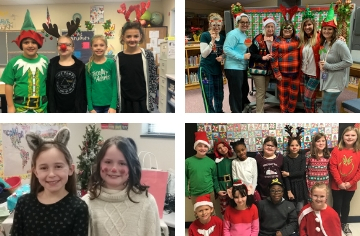 Our students and staff have had fun dressing up for Christmas Fun Week! 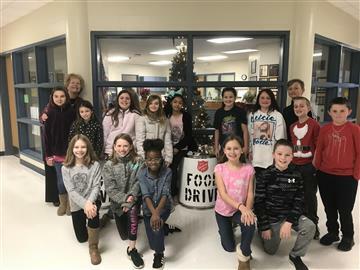 Student Council Collected Food for the Johnston County Salvation Army. 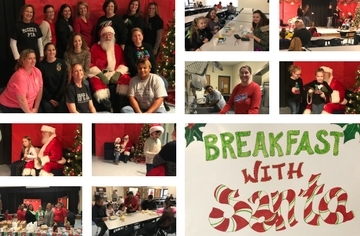 Breakfast with Santa was a HUGE sucess! 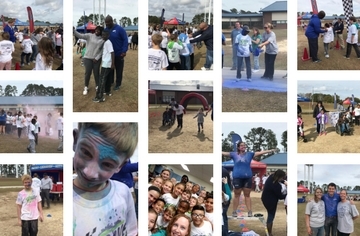 Our school raised MORE than $14, 000 so Mrs. Leonard got slimed by students, PTA and Boosterthon staff! 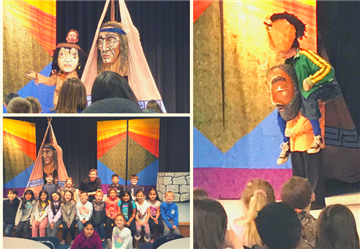 PTA Sponsored Cultural Arts Program Features Roger Day for Kindergarten and 1st grade students. 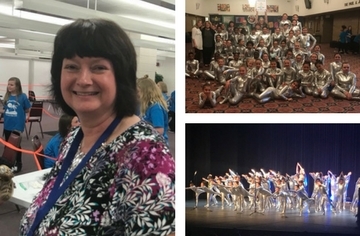 Our teachers are SUPER HEROES on stage and in the classroom! 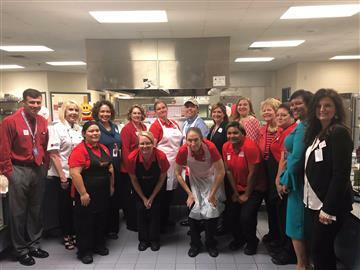 NC State Superintendent Mark Johnson and guests from DPI Child Nutrition, JCPS Child Nutrition, JCPS Facility Services, and JCPS Public Relations visited McGee's to celebrate National School Lunch Week! 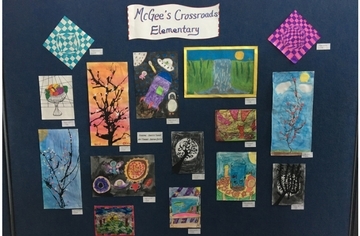 What a wonderful McGee’s community we have! 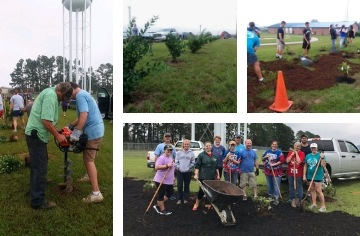 48 people came out yesterday to plant 90 shrubs beside the HWY 50 side of the school. 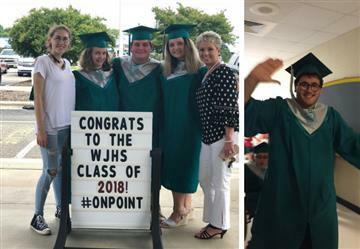 Thank you to all who came, C&J Nursery, WRAL, Hudson’s Hardware, and Wal-Mart! 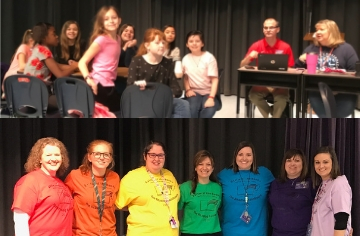 This team did an awesome job representing our school at the adult spelling bee! 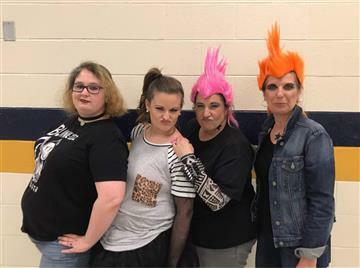 Thanks to the "Punkuators"! 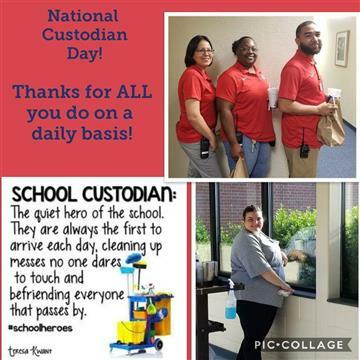 A great big THANK YOU to our custodial team who works so hard on a daily basis to keep our building clean! 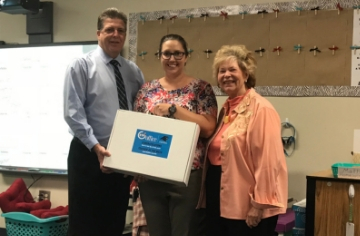 Sheena Allen was selected as a Week 6 Top 10 Finalist. 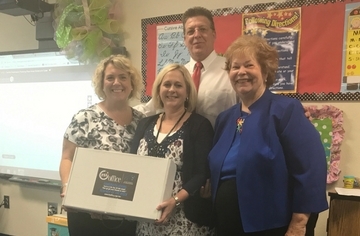 Visit FSIoffice.com to vote! 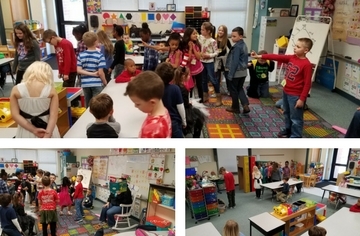 Students learn about flag etiquette. 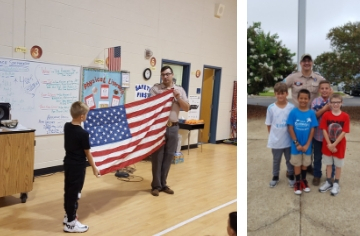 Stephan from the Tuscarora Council taught flag etiquette to our students today! 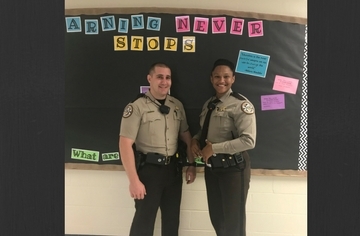 He also helped our Flag Patrol! 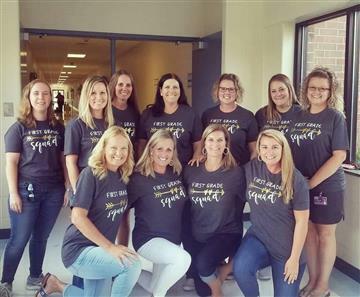 Our "FIRSTIES" snapped a quick picture during their planning. 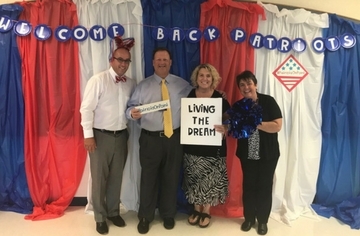 Dr. Renfrow visits on first day of school! 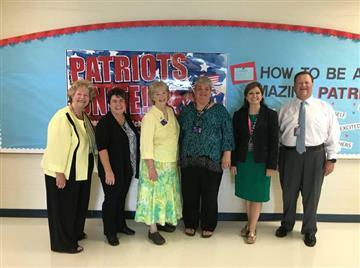 Honored to have our Superintendent Dr. Renfrow , Board Members Dr. Peggy Smith and Teresa Grant, and Crystal Roberts visit our school today! 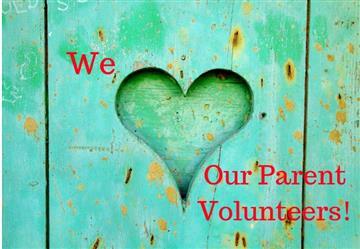 Staff had an awesome time being Servant Leaders this summer!. 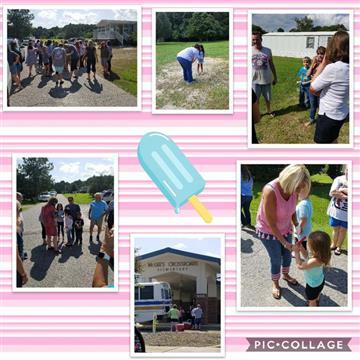 We took the school into the community to serve our students popsicles! Wonder where they'll POP up next? 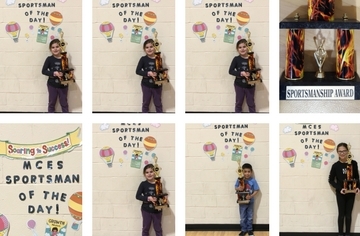 Coach Stephenson put together a day filled with fun events for our students and staff to enjoy! 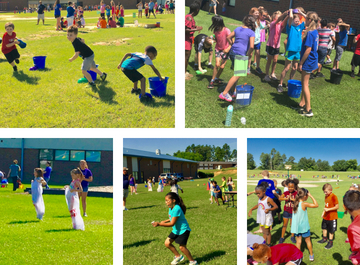 SpongeBob, sack races, and tug of war were just a few of the events. 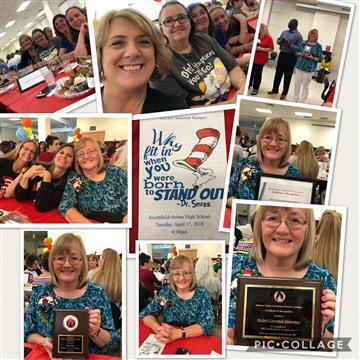 Congratulations Carmen White, MCES is proud of you!! 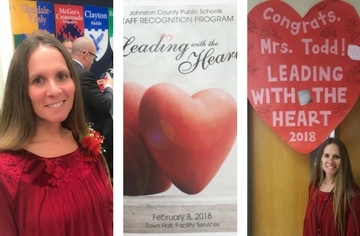 Johnston County Public Schools recognized the School Nutrition Manager of the Year and the School Nutrition Assistant of the Year at the annual School Nutrition Banquet. 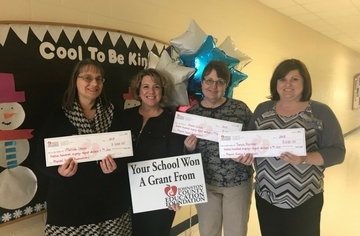 Kisha Cunningham of Selma Middle was named the School Nutrition Manager of the Year, and Juanita Jeeter of McGee’s Crossroads Elementary was named the School Nutrition Assistant of the Year. 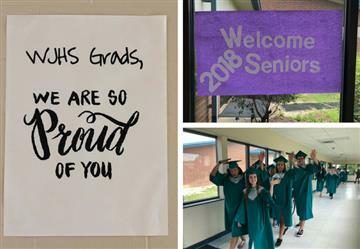 The Class of 2018 walked the hallways and were cheered on by students and staff! 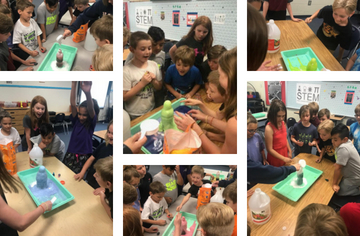 Third graders in Mrs. Scholz’s class had a BLAST creating volcanoes in STEM with Mrs. Williams! 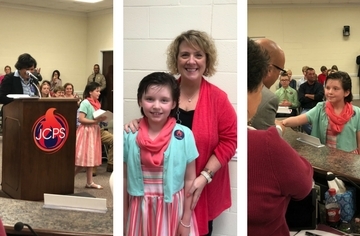 Our fourth grade student, Emily Beasley, was recognized at the April JCPS Board of Education meeting for displaying the character trait of courage. 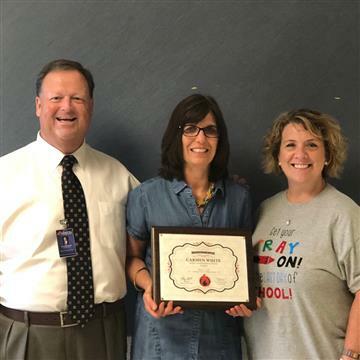 Congratulations to Tammy Baker, our Cafeteria Manager, for being selected the JCPS Classified Employee of the Month! 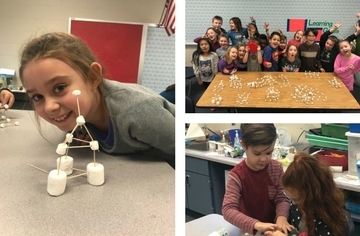 Mrs. Lillie’s students use their architect skills in STEM. 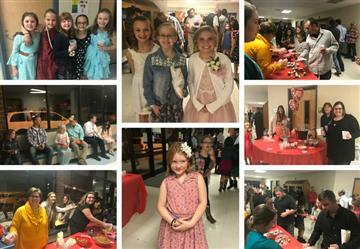 Noche Latina (Latin Night) was an evening full of fun for our families. 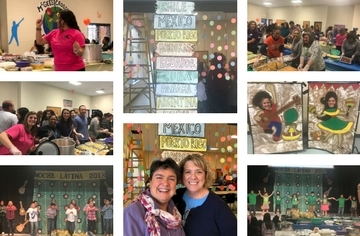 Mrs. Rojas, our ESL teacher, worked hard to coordinate a fantastic night that celebrated all of the Latino countries represented at MCES. We started with an interactive game on Kahoot and it ended with delicious food. 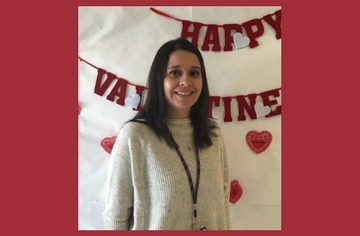 Many thanks to Mrs. Rojas, our MCES staff volunteers, families, and JCPS parent involvement coordinators, Francisco Ibarra and Gladys Pineda. 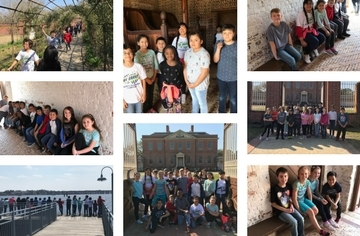 4th grade went to Tryon Palace in New Bern, NC on Friday, March 16th. 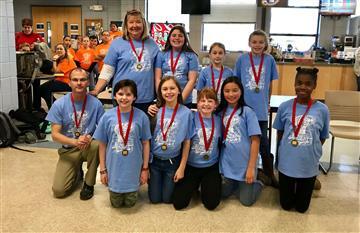 Congrats to our Battle of the Books Team for a 4th place finish at the BOB competition! 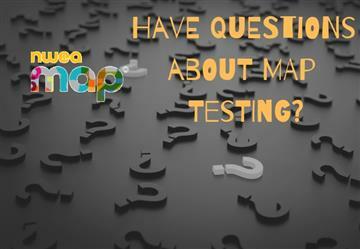 The students worked hard to read 15 books and prepare for the questions. Thanks to the coaches, Mr. Anderson and Mrs. Buchanan for your support and dedication to prepare our team! 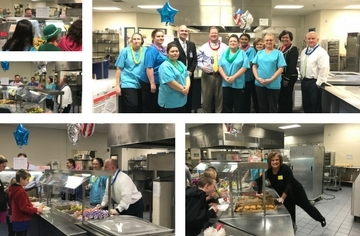 Dr. Renfrow and the JCPS Cabinet serve breakfast to our students for National School Breakfast Week with our School Nutrition staff. 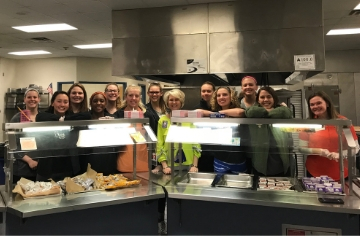 Thank you to our cafeteria manager, Tammy Baker for inviting them. 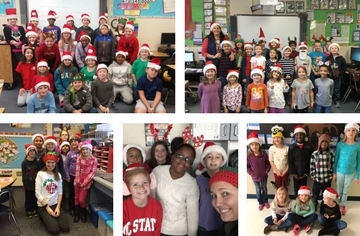 Mrs. Barbour and Mrs. Evans’ kindergarten class made Seuss-like hats decorated with 3D shapes to finish up their 3D shapes unit. 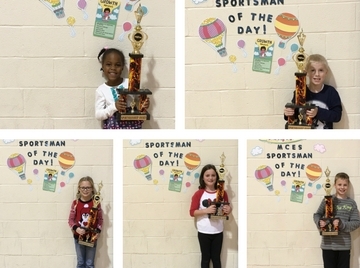 They presented them to the class and worked on public speaking. 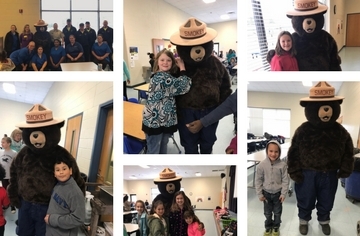 The 50-210 fireman, Ms. Atkinson from 210- McDonald's and Smokey the Bear stopped by to help us celebrate National Cafeteria Week! 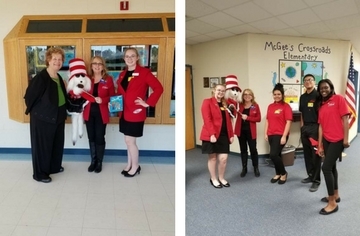 West Johnston FCCLA students visit McGee's to read to students during Dr. Seuss Week. 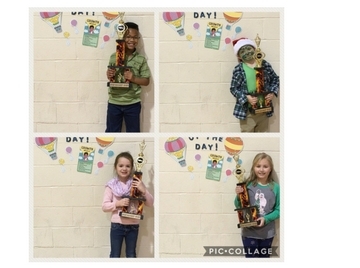 Staff and students had fun celebrating last week! 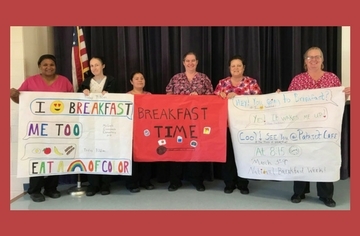 Our Cafeteria Staff is Preparing for Next Week! 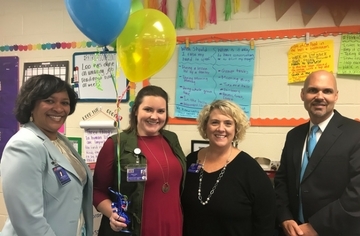 Congratulations to Lori Sharpe, 5th grade science teacher, for being named a Top 20 Finalist for the JCPS Flame for Learning Award! 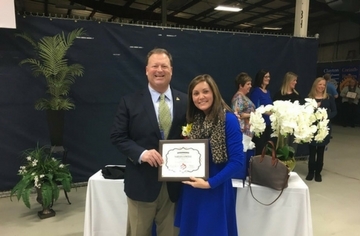 Congratulations to the MCES Outstanding First Year Teacher of the Year, Krisha DuBois! 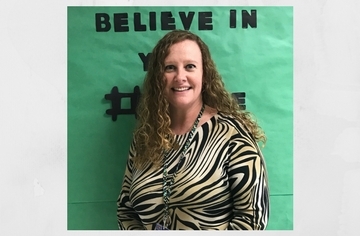 Mrs. DuBois teaches 5th grade science. 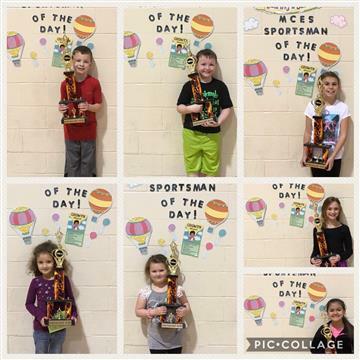 Congrats to our students chosen for displaying Sportmanship in PE: 1/25 Samantha Stanley (5th), Jordan Rodriguez (K), Charley Carroll (3rd) 1/30 Bowden Warstler (3rd) 1/31 Jason Valdiviezo (1st) Feb. 2 Hannah Wise, not pictured (2nd), Olivia Duchesne (1st) #proud of you! 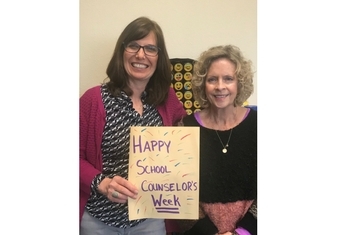 MCES thanks our counselors, Mrs. White and Mrs. Callahan for their hard work and dedication to the students and staff each day! 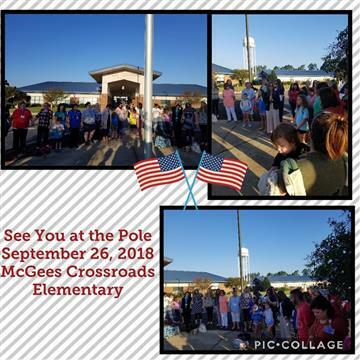 Johnston County Veterans visit McGee's! 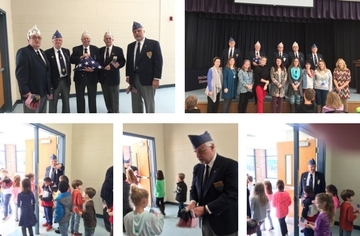 Johnston County Veterans Unit 40/8 presented flags to first grade students. 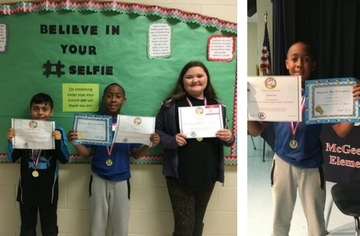 Champ: Jayden Gary (center); 1st Runner Up Erick Guillen-Cortes (left); 2nd Runner Up Lacy Hart (right) Way to go!!! 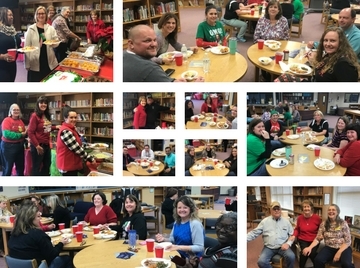 Our staff was provided lunch by Benson Grove Baptist Church. They cooked a pig and and served side dishes and desserts. Mr. Donnie Tippett and Brian Dixon for stayed up all night to cook the pig. 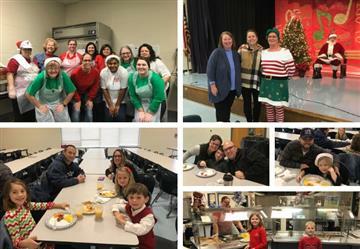 We love our community, and we are grateful they offered to serve our staff! 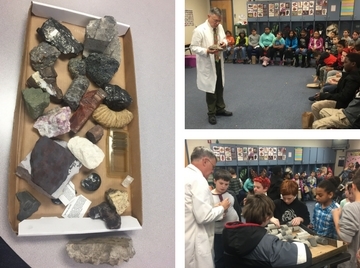 Mrs. Smith, 4th grade teacher, welcomed guest geologist, Dr. Michael McClure, to speak to her two science classes. He brought sample rocks for students to observe and he shared information about the formation of these rocks. 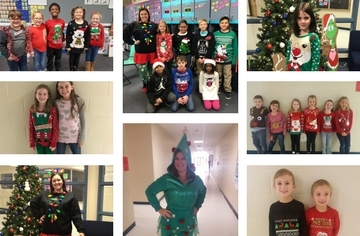 Day 4 of Spirit Week! 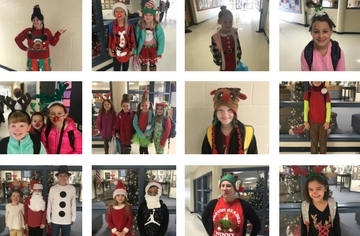 More of our favorite Christmas characters! 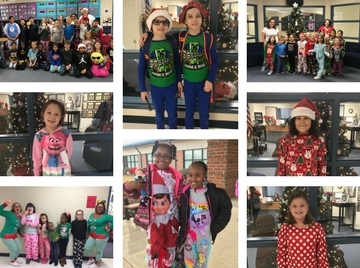 Day 3 of our Spirit Week! 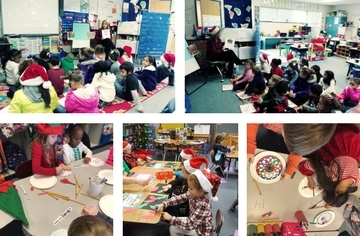 Kindergarten classes studied Christmas traditions around the world. 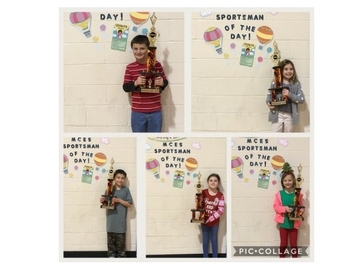 Day 1 of our Spirit Week! 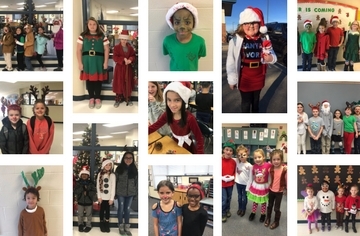 Pancakes and Photos with Santa! 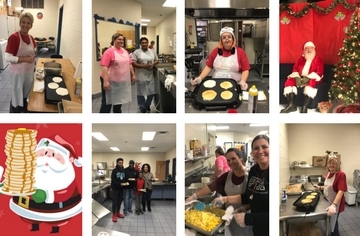 More Breakfast with Santa Fun! 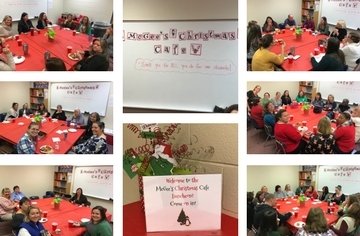 Staff and parent volunteers came together to make the breakfast a huge success! 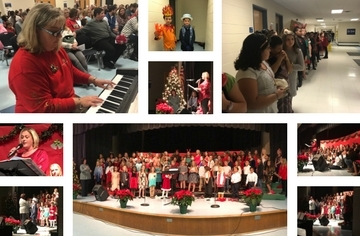 The students took the stage to perform with the 18th Annual Holiday Chorus and Christmas Tree Lighting! 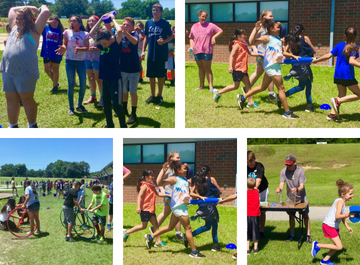 Students, staff and parents had a blast at our Fun Run! 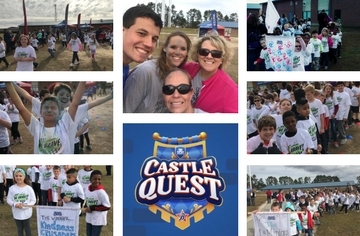 Our Fun Run Team was awesome! 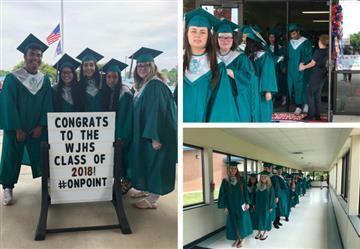 Congrats on a Great Drill! 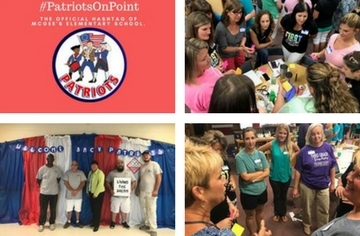 During our first lockdown drill, our staff and students truly showed what it means to be #PatriotsOnPoint. 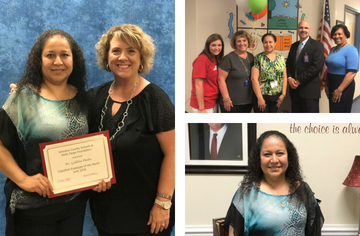 JCPS/Wells Fargo Foundation Certified Employee of the Month! 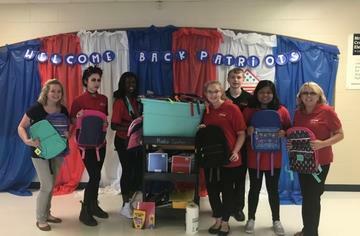 e are extremely grateful to the WJHS FCCLA for the donation of school supplies! 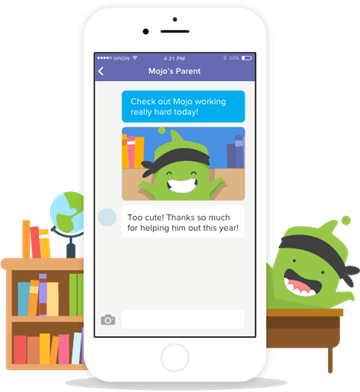 It's almost time to head back to school for a great new year! 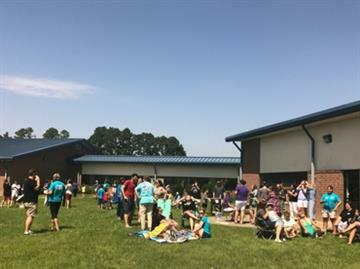 McGee's Elementary was excited to host parents & students at our Eclipse Event. 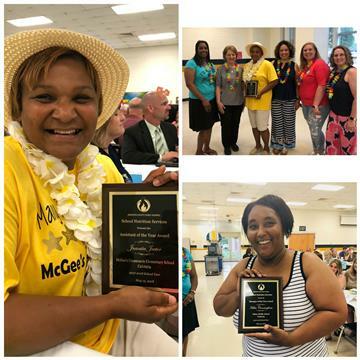 McGee's Elementary teachers attended a county-wide event to kick off the 2017-2018 school year! 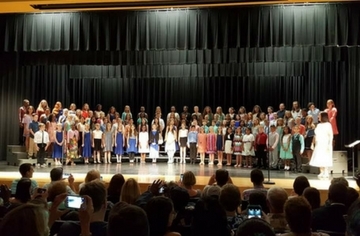 McGee's fifth grade students represented our school proudly during the fifth annual All County Chorus event at Selma Elementary School. 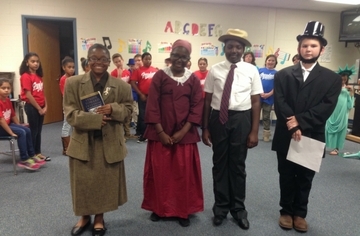 The Patriot Chorus shared their singing, dancing and acting talents in a presentation called "Freedom."